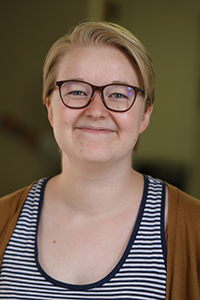 Hannah is a mixed methods sociologist with an interest in intersectional studies of gender, race, politics, and religion. She hopes to refine effective measurements for racist sentiment in quantitative research and find more accurate ways to quantitatively study whiteness, white supremacy, and political/religious behavior affected by racial ideology. Hannah received a Bachelor’s degree in Professional Writing with minors in Sociology and International Relations from Taylor University in 2017 before coming to Baylor. She came to Baylor because Baylor’s emphasis in pedagogy and classroom experience are important to her as an aspiring future professor at a liberal arts institution. Since being at Baylor, she has had the opportunity to work on several different projects with different methodological approaches, developing a well-rounded skillset in many different kinds of research. Baylor’s commitment to graduate students being able to network and develop relationships outside of the university has also given her the opportunity to attend and present at several conferences this year. Upon completion of this program, she hopes to begin a tenure-track lecturer or liberal arts professor position, where she can teach and partner with students on their journey of better understanding the world we live in and how it affects their roles in society. Hannah Evan's Full Curriculum Vitae.